We are only a few weeks away from the worst time to be a sports fan. The Super Bowl will be over and with it another season of futility for my Miami Dolphins. We’ll have the better part of a month to wish it was March and therefore time to fill out our tournament brackets with any number of theories on why this team or that one will end up in the Final Four. You will try to convince yourself that just because you did not watch one minute of college basketball up to that point that your opinions should still be valid. But really we’re all just biding time until Baseball and Opening Day. This is my favorite picture hanging in my house. I’ve had it since 1991 when my mom got it framed for me. It’s gone with me through a handful of moves, but I always make sure to find a place for it. While I know the exact point in time that I became a Miami Dolphins fan (January 23, 1983 The Miami Dolphins defeated the NY Jets in the AFC Championship game and that was all it took – I shudder to think what would have happened had the game gone the other way), I have no idea when I became a Braves fan. At some point it became a part of my conscious, surely helped by lots of readily available viewings on TBS. 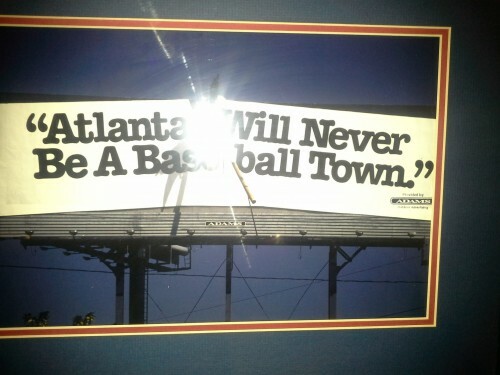 But it was probably cemented by the trips to Atlanta I spent with my Dad. We would do a week there, and then a week in south Georgia with my relatives. During that Atlanta week we’d see the Braves at least twice (there might have been even one year where we saw them three times). Looking back I can’t say I remember any specific game that we went to, though I remember seeing them play the Padres at some point (possibly more than once). At one point I even knew their record in games I went to (for such a terrible team during most of the 80s, they tended to win more than they lost when I was there), though that knowledge is long since lost from the recesses of my mind. I remember my Dad telling me stories about the Braves though. “Did you know that Dale Murphy used to play catcher?” “Did you know that Pascual Perez once got lost on I-285?” (It is the perimeter around the center and he never got off… just kept going in a circle). And I knew I would get a chance to see Dale Murphy play. In person. Number 3. Your starting center fielder for the Atlanta Braves (maybe he’ll hit a home run!). In Waycross, Georgia (the largest city, in the largest county, in the largest state… east of the Mississippi – look it up) (where I lived) you better believe that Braves cards were gotten at a premium. 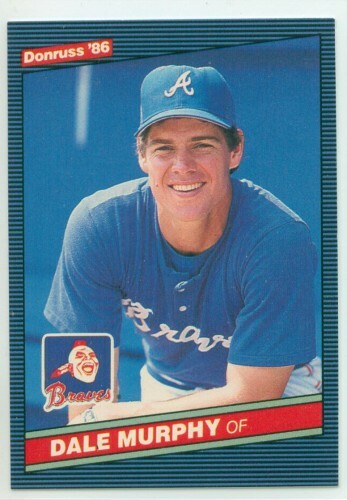 But a Dale Murphy? That was the end game. You opened pack after pack in hopes of seeing #3. I’m pretty sure I have this one… sadly it is not worth what it once was. 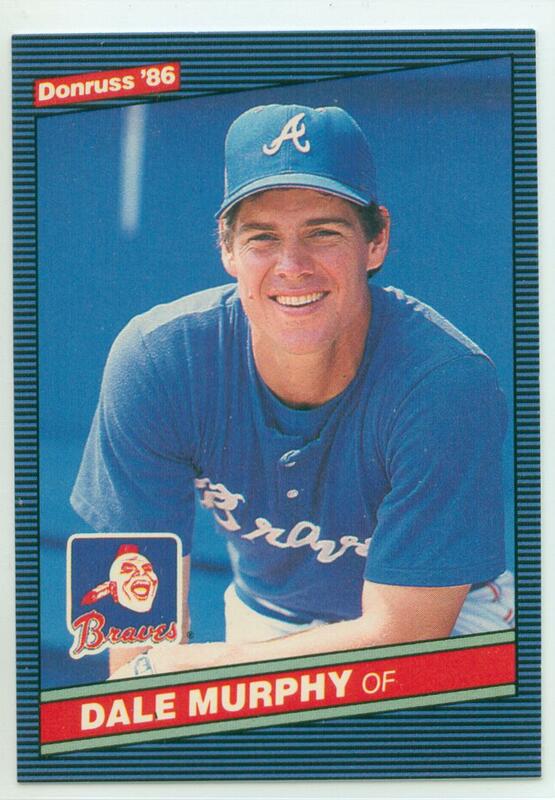 Mercifully much of the 80s Braves, for me, is tied less to their record and more to their baseball cards. And it really remained that way until 1991. But in 1991 it all changed. 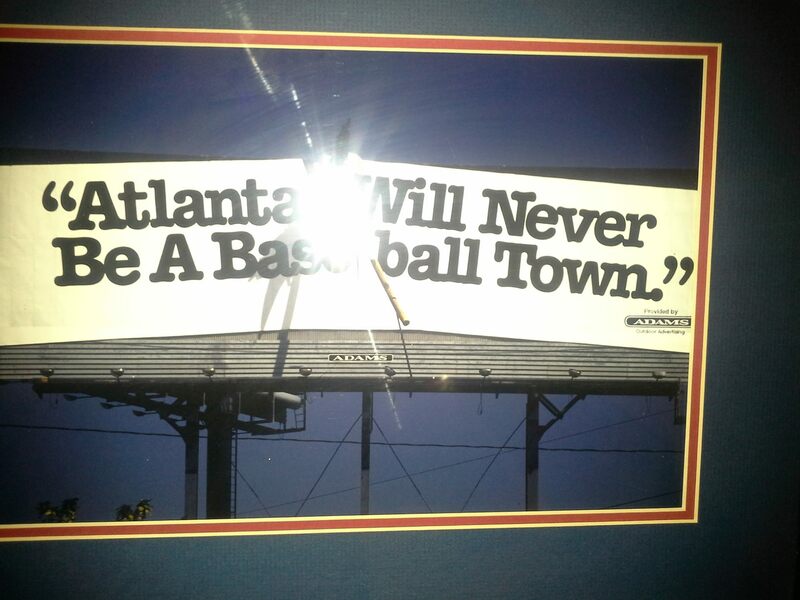 I remember how that season made every single person a Braves fan. I went to our High School Homecoming football game and people were doing the tomahawk chop (by the way, yes we stole it from Florida State… who cares, most of those people were Braves fans anyway). People would honk their horns and stick their arms out the window. And every night as the season progressed I’d look in the paper to see if the Dodgers had won the night before. And when they won the division? And then when they won the NL? It was ridiculous. There is no other words to describe it. And had Ron Gant not been pulled off the bag by Hrbek, well… (no, I’m not still bitter about it 22 plus years later). Still, they were not the losers anymore. For the next decade plus we got treated to seeing one of the greatest rotations of all time. I don’t know that I even realized it until it was close to over at the end of the 90s. 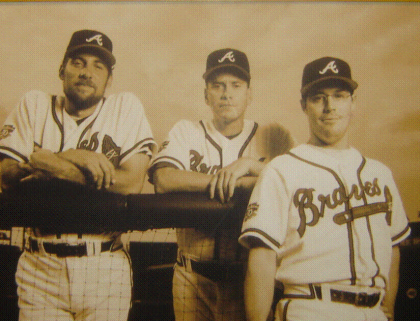 Maddux, Glavine, and Smoltz under Bobby Cox’s managing brought wins to a town starved for them. It is a fine thing to accomplish winning, but when you win as much as they did and make it where people are slightly bored of the winning (not me, but some). That is a true accomplishment. They turned the Atlanta Braves into a model for how to win. Last week two of those three were voted into the Baseball Hall of Fame. And while I would join my voice in with the people who feel Maddux should have been a unanimous decision (if not for people gaming the system), I’m too excited about the prospect of this years ceremony being so Braves focused. Though there is a bit of weird timing as this year will be the first without any true tie to those division winning teams (Brian McCann leaving to become a Yankee) is the same year where a huge reason for their being a streak will get their honor by all of the baseball world. I guess it really is the end of an era. And yeah, maybe we only won the 1 World Series, but being it the thick of it every year, having a chance… I’ll take that all day long. Smoltz will be in there shortly with you guys. Tagged Atlanta Braves, Hall of Fame, John McGuire.